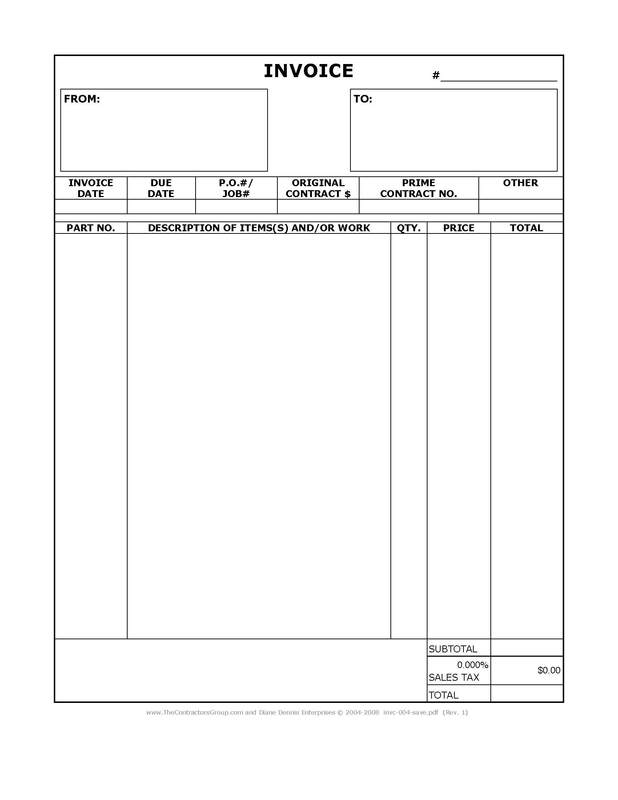 Looking for a construction invoice form? Get one here! The frustration that comes with preparing an invoice for a construction project can be extra troubling because of the added concern about the bad things (very bad things) that can happen if you make a mistake(s). The time to start invoicing on a project doesn't come when it's actually time to submit an invoice, it comes during the beginning phases of the project. How often should you submit a construction invoice on a project? What is retention and how does it affect your invoice? What's required to be included in/with the invoice? What happens if you make a mistake on your invoice? What do you need to do after an invoice has been paid? How often should you submit invoices on your project? Submit one invoice, when your work is complete, for the entire amount of the project. Do not deduct retention. You may or may not be required to itemize your invoice. Typically when on projects that last less than a month a non-itemized (or minimally itemized) invoice is acceptable. There are Generals/Directs/Primes however that require that you invoice using their paperwork. Find out for sure so that you don't waste time putting together an invoice that won't be accepted. Submit one invoice when your work is complete. That invoice will be for the full dollar amount of your contract less the retention being withheld. 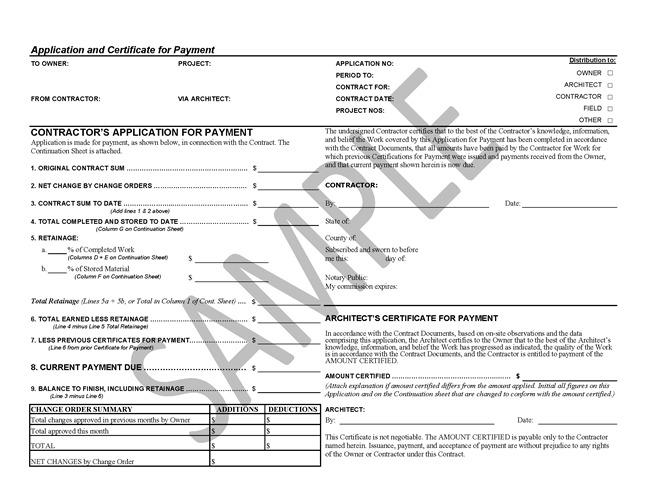 You'll use the #1 lien waiver/release form with this invoice. Once that invoice has been paid and the funds are 'good' (meaning they've cleared your customer's account) then you can send a second invoice that'll be for the amount of retention that was withheld. 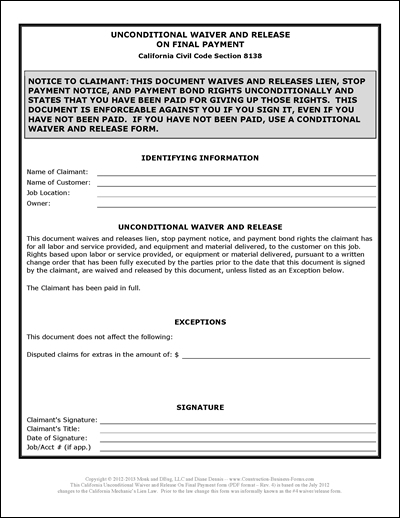 You include a #3 lien waiver/release with this invoice. At the same time, provided the customer's prior payment(s) have cleared, then you'll issue a #2 lien waiver/release form that releases the customer from all amounts due through the date you invoiced through. Once the second invoice has been paid and has cleared your customer's account then you can issue the #4 lien waiver/release form. Before preparing your invoice be sure to check with your customer to make sure there isn't an invoice form that they require that you use, rather than your 'normal' one. For each month that you work on the project you'll submit your construction invoice at the beginning of the following month (typically) for the work performed/material supplied during the prior month. On each of these invoices you'll need to deduct the amount of retention from the total amount being invoiced. When submitting the #1 lien waiver/release form with the invoice be sure to put the dollar amount after the retention is deducted, do not include the retention amount on the waiver/release form. You'll continue on in this manner each month until you're finished, with each month's release showing the dollar amount *after* retention, not before. Your final invoice will be for the retention that has been withheld. You'll include a #3 lien waiver/release with this invoice as this will be the last payment that you'll receive on the project. ** If your customer insists that you use his invoice form you can upload a copy of the invoice form here and it'll automatically become a digital document! The more complex a project is the greater the chances that invoicing will be 'standardized'. This is accomplished by the General/Direct/Prime providing an invoice document that all Subs are required to use. If you're required to use their invoice paperwork that information should have been included within the contract. What is retention and how does it affect your construction invoice? Retention is the amount of money that will be withheld from each months' amount due to you (provided retention *is* being withheld on the project). Typically it's 5% to 10% of the current invoice. Too often contractors would collect full payment and then walk away from a poorly done/incomplete project. The owner of the project is out his money and now has to pay another contractor to complete the work. Retention can help to ensure that the contractor will indeed complete his portion of the project - if he leaves the owner in the lurch he walks away without his retention. On some projects retention can amount to the actual profit on the job making it even more difficult to walk away. How long is retention withheld? If this is important to you, the timing of the release of your retention, then be darn sure to find and read the retention clause in the contract before you sign it. How to figure out the retention amount? To figure out the amount of retention that'll be withheld you'll prepare your invoice for whatever amount is owed for the time frame that you're invoicing for. One of your last line items will be Retention and it will be for a negative amount (because it's being withheld from the payment). When you submit a lien waiver/release form with your invoice do not include the retention on the release form ($950 in this case); the total on the release form should be the final total on your invoice after retention is deducted, which in this case is $8550. If you write $9500 then you'll be releasing your lien rights 100% for that time period whether you've been paid that retention or not. What's required to be included in/with a construction invoice? When you submit a construction invoice to your customer typically there is additional information required from you. Almost always used on every construction project are the lien waiver/release forms. Where you're at in your project will determine which of the four documents you'll use. When you're invoicing for a partial/progress payment you'll use the #1 Conditional Waiver and Release Upon Final Payment. Remember, don't include the retention amount in the amount due, it's a deduct. After the funds have cleared the customer's account then you'll use the #2 Unconditional Waiver and Release Upon Progress Payment. This means that you have fully released your lien rights on the project for the time frame through which you've billed (except for retention - you did remember to deduct the retention before entering the $ amount on the #1 release right?). When you're submitting an invoice for the final payment on the project (which is almost always for the retention withheld) you'll include a #3 Conditional Waiver and Release Upon Final Payment. After the funds have cleared your customer's account then you'll submit a #4 Unconditional Waiver and Release Upon Final Payment. This means that you have released your lien rights for the entire project. It's desperately important that you get that correct. Something, not too entirely common, that you may also be required to submit is a copy of your supplier's invoice. You don't necessarily have to do this; you can check the contract to see if it's required although if you read the contract before signing it then you probably already know. If it does not appear in the contract then it's time to decide whether or not it's worth it to pick that battle, or just supply the requested information. If it does appear in the contract then you're pretty much stuck providing it. Don't worry about it though, they may just be checking to make sure that the material is being paid for (although it's true that many are trying to figure out your profit margin). Regardless of their reason it's a big fat SO WHAT that if they want the information. Give them the info without a backwards glance. You're confident in your numbers and your value; that's at least half the battle. Yes sometimes they'll use it to try to 'nickle and dime' you on your next project. Do you really want to be 'nickle'd and dime'd' on every project you do for that guy? Take a few minutes and check ContractorsCustomers.com to see if your potential customer has been reviewed there yet. Maybe this is his standard operating procedure, to beat contractors into the ground. Should you be asked to provide a labor release form they're checking to make sure that your employees are being paid. After having been ripped so many times by others the guy who is your customer has made it part of his procedure. Don't take offense. You're required to provide all documents the contract calls for. If you make a mistake on your invoice/lien waiver-release forms you're probably in for trouble. A Subcontractor can't argue that a lien waiver/release is invalid when it's due to a mistake made by the Subcontractor. The 'exception/exclusion' clause in the lien waiver/release forms doesn’t apply to charges that were excluded because of a mistake. The 'exception/exclusion' clause only protects the subcontractor as to charges listed as an exception. A statutory lien waiver is typically absolute. If a subcontractor makes a mistake, he's waived his lien rights if the general/direct/prime contractor or owner wishes to enforce the waiver document. The subcontractor can't argue that the lien waiver is invalid when it's due simply to the fact that the subcontractor made a mistake. However, the subcontractor may still be able to bill its customer the additional amounts owed. That's another article though, as there is much involved with that. As soon as I have that available I'll put a link here to it. Be sure to subscribe to my newsletter for updates. What do you need to do after a contractor's construction invoice has been paid? When you receive payment on an invoice make a photocopy of the check before you deposit it. Or if you deposit it through your phone then just be sure to keep the check for reference. Note: No matter how much your customer bugs you, do not provide an unconditional release until the funds related to that release are in your account. In a couple days time call the bank that the check is drawn on. You'll want to find out if the check has cleared the account yet. The reason you want to know if the check has cleared their account is because you do *not* want to issue an unconditional waiver/release form (#2 or #4) until those funds have cleared your account. The best thing is to just make sure that the payment has cleared and is in your account before issuing an unconditional release. Receiving the check for the construction invoice is NOT enough, again ... make sure that the payment has cleared your customer's account before you issue an unconditional release. * At the end of a project you'll probably be required to also provide a warranty for your portion of the project. Below are a few forms available for purchase at my Yahoo store. Click on the form image to go to that page at the Yahoo store. Please enter your comments and questions about this article in the box below. A Very Warm Welcome To This Wonderful Tool For Your Job Sites & Offices! ANY form can now be filled in "on the fly"
Click here to visit PDFFiller. You'll be able to upload any and/or all of your company documents; fill them in on the fly (even if they're not already "fill-in-able"); and easily collaborate with, and distribute the documents to, others. The form(s) reside in your library at PDFFiller waiting for you whenever you need them. The Construction Contract Writer creates and manages your contracts for you. Click here! 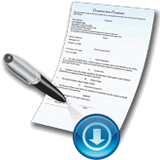 Construction forms that you can download and use instantly upon completion of your purchase. AIA style Forms G702 & G703 Application And Certificate For Payment - Click here for more information! All articles are the opinions of the respective authors and do not necessarily represent the opinions of other persons involved with this website. Nothing on my websites is to be considered legal advice. Everything is written from "in the trenches" experience. Please contact an attorney for specific legal and/or other advice. Your use of my websites is your acknowledgment and agreement to this policy.